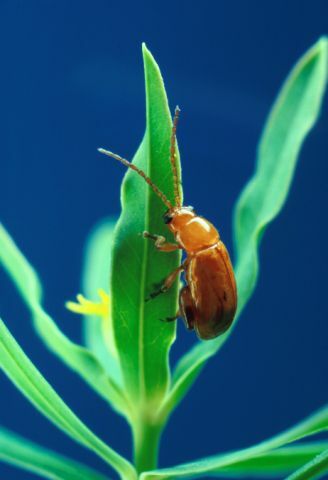 Feeding habits: They eat small round holes in the leaves of potatoes, peppers, beets, brassica, and other crops. Young sprouts are often a target. 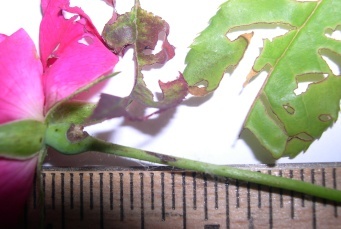 Leaves are skeletonized, giving plants a bleached appearance before they wilt and die. 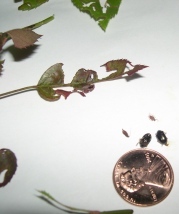 Larvae feed on roots and tubers below ground. They leave brown snake-looking marks on potatoes. Natural control: Beneficial nematodes control the larvae in the soil. Encourage biodiversity in the garden: plant a varied mix of crops along with susceptible plants. Encourage biodiversity of insects, birds, plants, and small animals and spray Garrett Juice plus citrus oil. Neem sprays will also help. Fleas can be controlled with good nutrition. Animals with decent diets will not have serious flea problems. See Malcolm Beck's book Lessons n Nature for the paunch manure story.